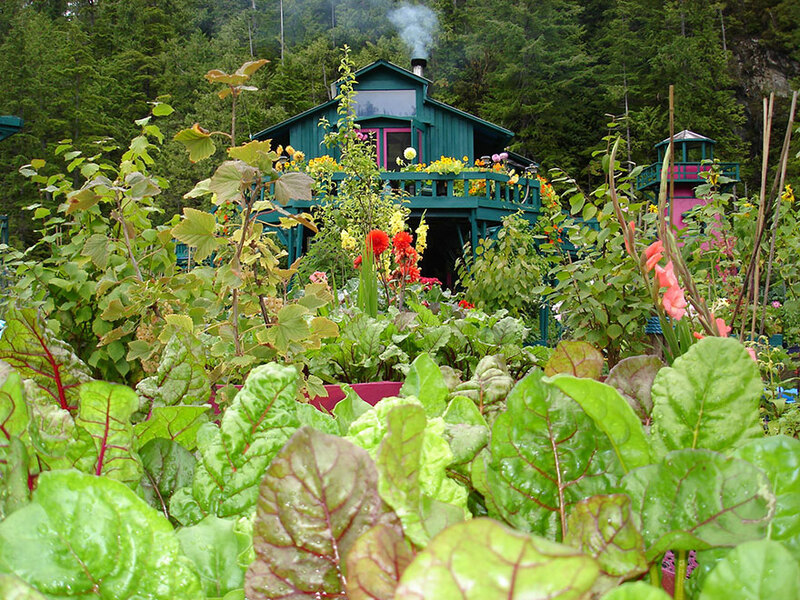 When Wayne and his partner Catherine decided to go off-grid, they did it in style. Indeed, after more than two decades of work, you’ll scarcely believe the amazing structure that they’ve built in a remote corner of Canada. It’s mind-blowing. In 1992 Wayne Adams and Catherine King had had enough of life in the city. So, they decided to make a daring move, leaving the hectic urban streets far behind and heading deep into the beautiful, rugged Canadian wilderness. 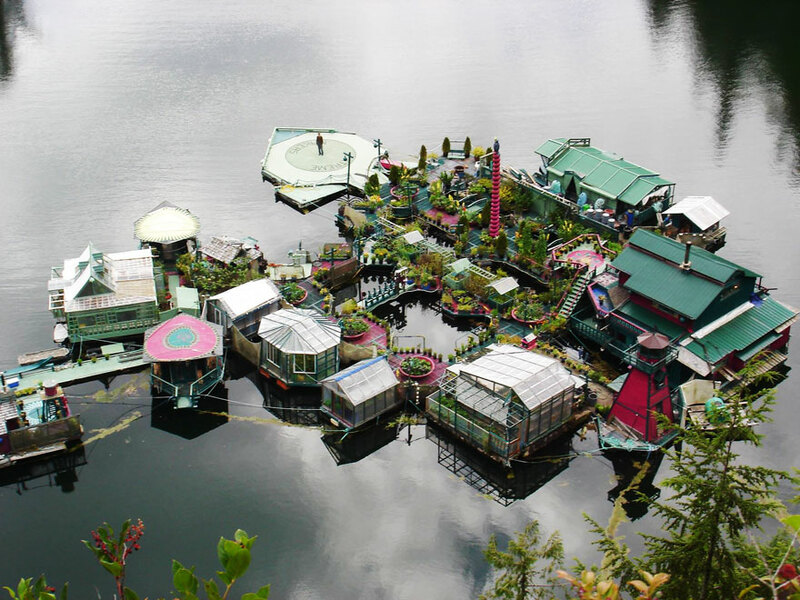 The Canadian couple, now 68 and 60 respectively, decided to build their new life near Tofino, British Columbia. 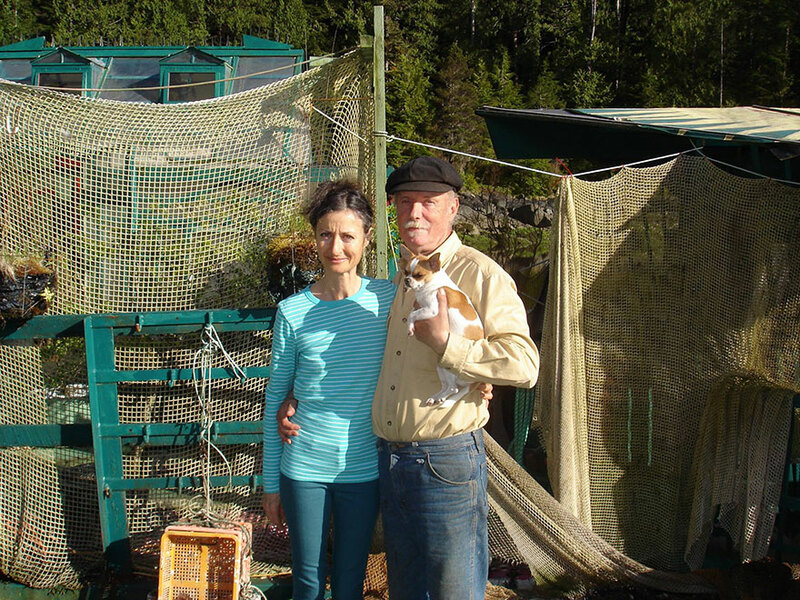 With less than 2,000 residents, the town on the west coast of Vancouver Island is pretty remote, but what this intrepid couple had in mind was even more extreme. 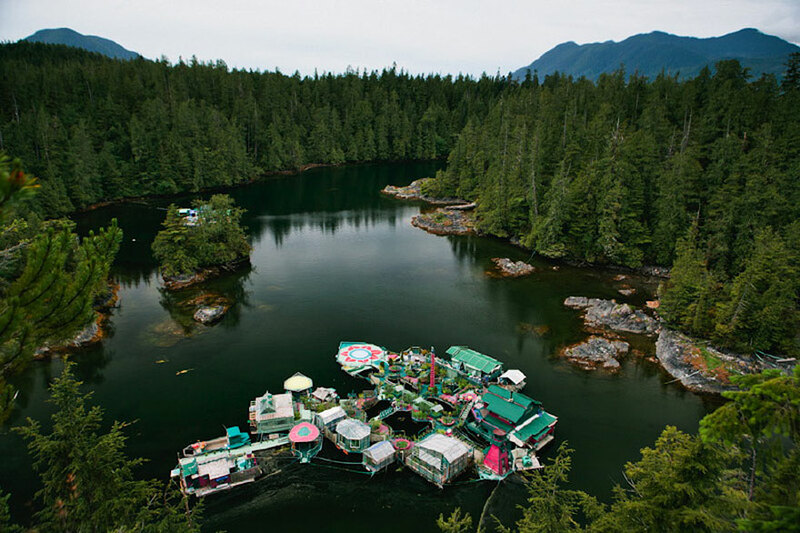 Outside of the town in a quiet inlet, Adams and King began to construct a formidable, off-grid floating structure. Now, over 20 years since they began this epic construction project, their floating home is an incredible, multi-colored palace. 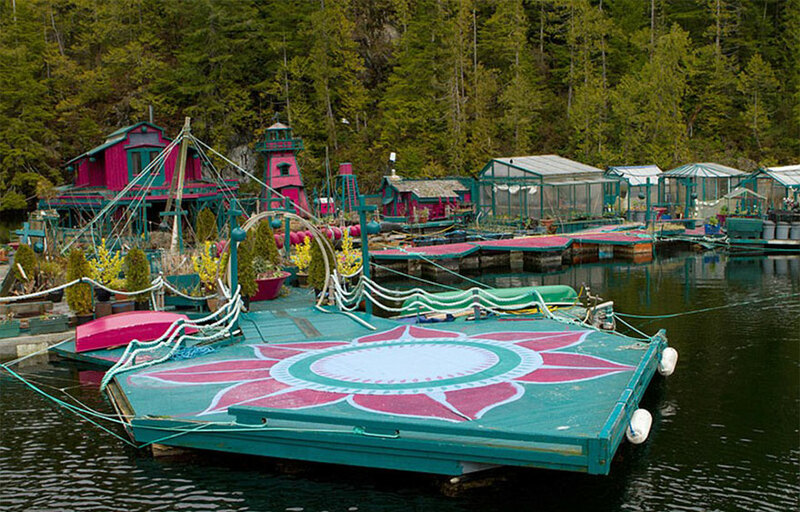 Freedom Cove, as they named it, is made up of 12 separate platforms all interlinked by walkways. 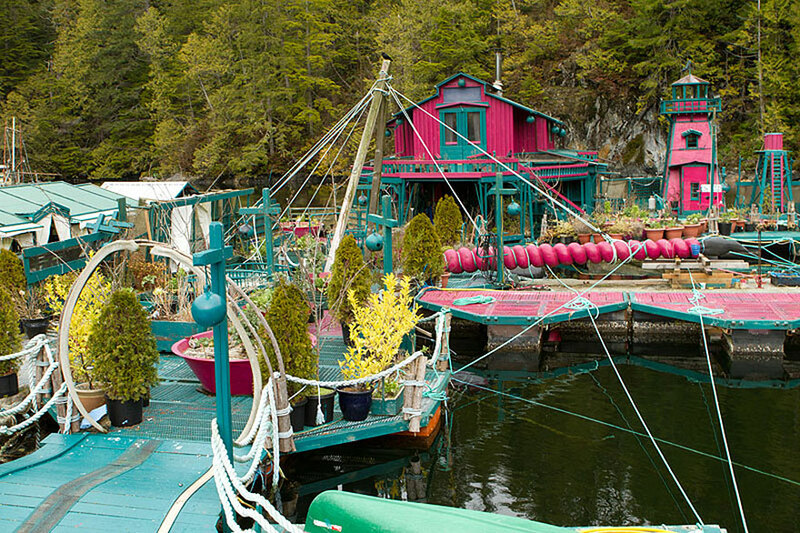 Aboard this floating Eden, then, the couple live a completely self-sufficient lifestyle. And, needless to say, it’s pretty idyllic. And the couple are self-sufficient in terms of sustenance, as well. 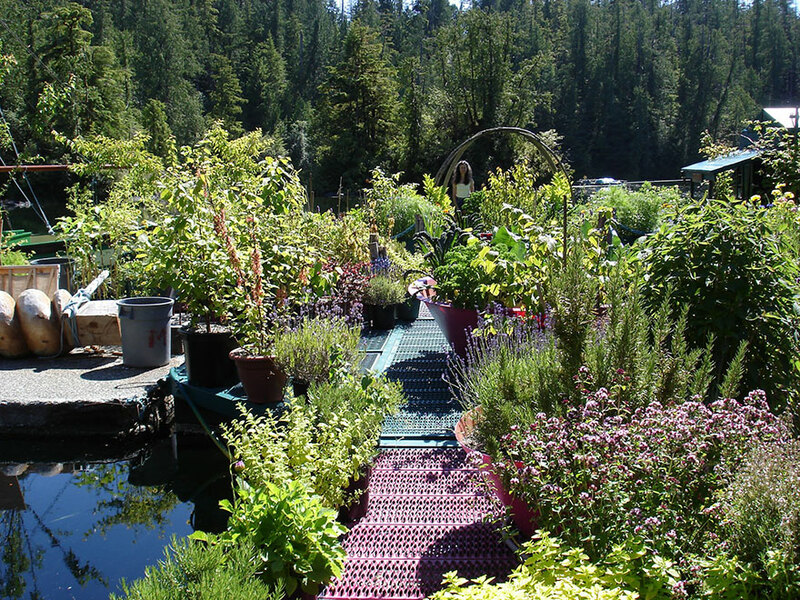 With over half an acre of land and five greenhouses available to them, they are able to grow more than enough fruit and vegetables. Furthermore, with all this space, and the ability to build whatever they want, they’ve added some pretty cool extras. 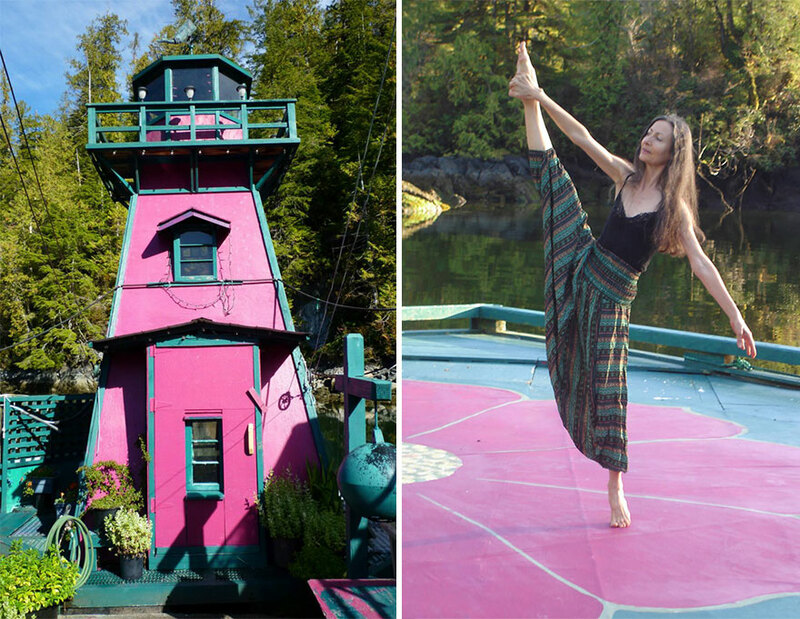 Alongside the living quarters and garden structures, the couple have built an art gallery, a lighthouse and even a dance floor. Thankfully, the couple are more than qualified to have been dealing with this epic construction project. Adams is a professional wood carver who – as well as having built all the timber structures – makes a living through the sale of his artwork. 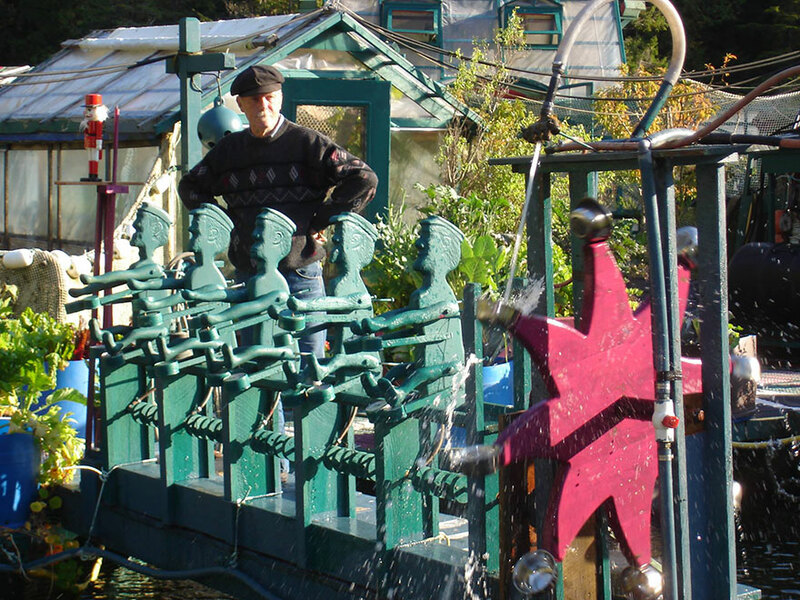 Indeed, many of his stunning creations can be seen dotted across the site. Meanwhile, King is a retired ballerina. 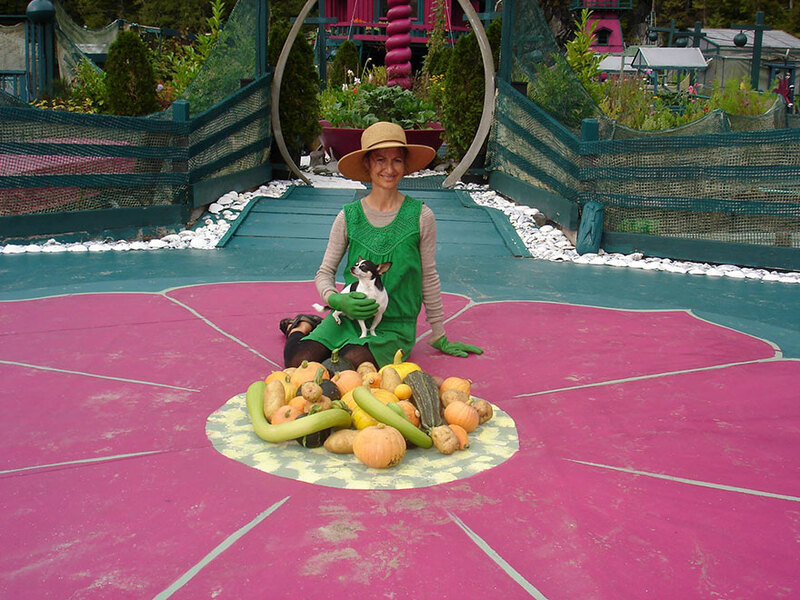 She is responsible for Freedom Cove’s vast, and incredibly fruitful, vegetable garden. But as well as her being a green-fingered gardener, she has a passion for painting, writing and music. The couple’s beautiful home is, then, a testament to their creativity. And with so much wood, and inspiration, around, it wasn’t long before King picked up some of Adams’ carving skills, too. In fact, after acting as his apprentice, she eventually became so good at it that she developed a unique style of her own, and her pieces are now selling as well. “Living in the wilderness is constant inspiration,” King said in an interview with The Huffington Post. “It’s so incredible to wake up every morning and see all of this.” Imagine living a life like that, cut off from all the stresses and worries of modern-day living. Of course, living so far away from any major cities, the family are able to get up close and personal with some of Canada’s amazing wildlife. They’ve got deer, otters, sea birds and even wolves right on their doorstep. That said, there are some animals that the family would happily avoid bumping into. Living on the water, they have to contend with huge rats – weighing up to 30 pounds – that chew away at the foundations of their home. And living in the wild is a nightmare for livestock, too. 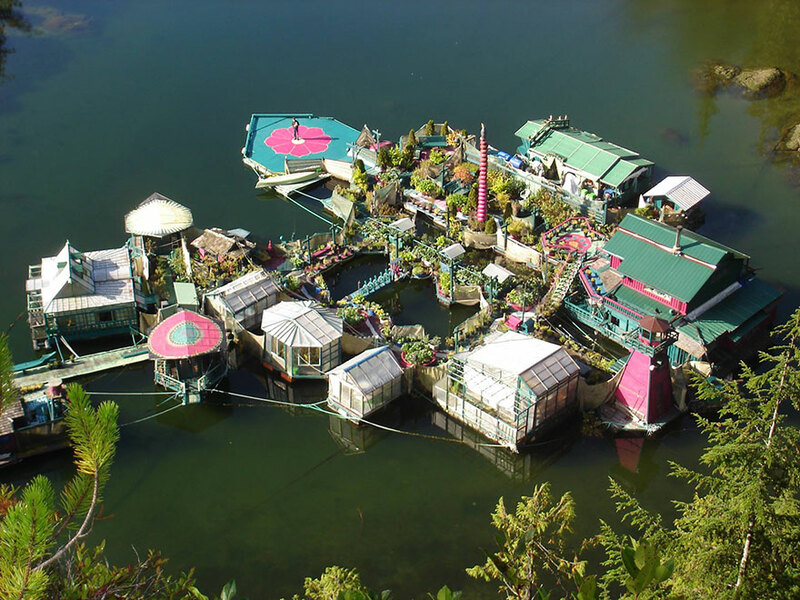 The couple decided to have a go at rearing chickens on their floating complex, but they soon gave up when they realized how many critters out there would happily eat them. Still, there’s a lot to be said for a diet based on fresh fruit and vegetables. Despite its remote and inaccessible location, though, the house has become something of a tourist attraction, and King and Adams are more than happy to welcome visitors to their home. 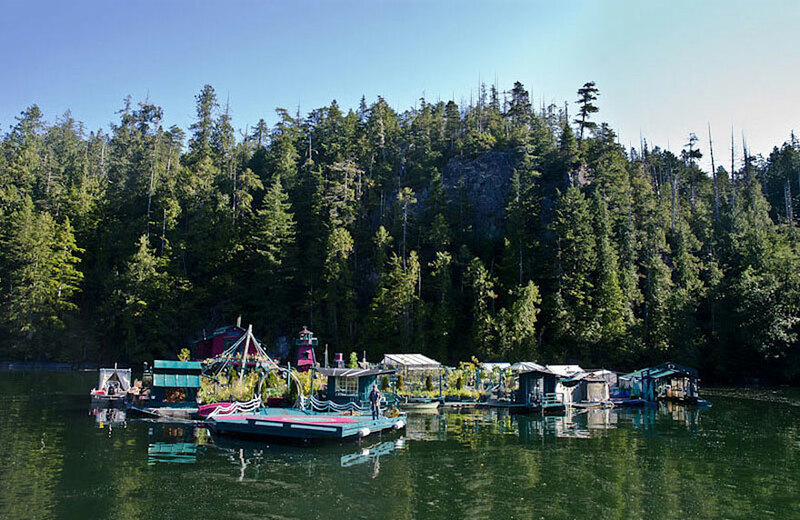 There are even dedicated tour operators who combine whale and bear watching trips with a visit to Freedom Cove. What’s more, when the internet got a sniff of what the family were doing in remote British Columbia, things went pretty crazy. The story was covered by news organizations and magazines all over the world. “This whole home is for the kids in our family to come and see what you can’t learn in school anymore,” said Adams. “When I was young, this is what you learned in school – skills… To share this with the community and young minds, that is the teaching here on the west coast.” The couples’ kids must, then, have had the kind of childhood that most of us can only dream about. However, one of the most beautiful things about this inspiring project is that it still isn’t finished. Indeed, every year Adams and King will continue to add extras to their dream home. So who knows what it will be like in another 20 years?